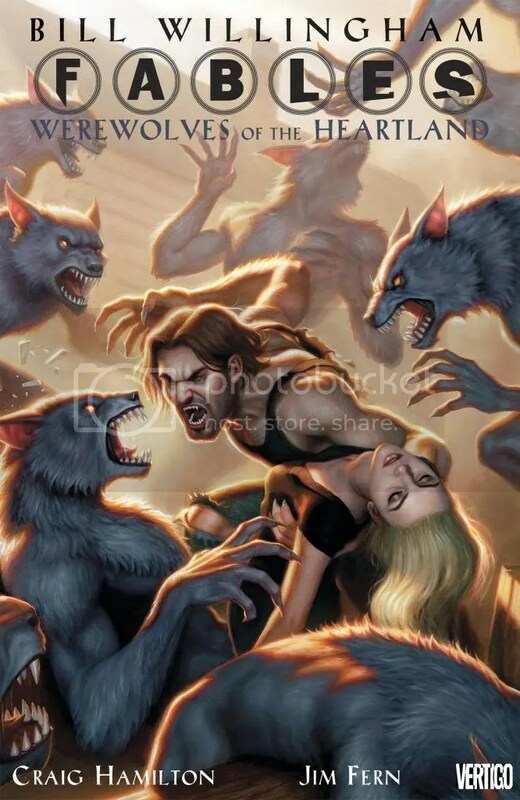 A new storyline continues in the unique world of Fables, as we focus on our main story at hand: that of Bigby and his family. The great North Wind was the one to finally slay the seemingly indestructible Mr. Dark, but has paid the ultimate penalty in losing his life. Now a successor must be chosen to take the throne, and Bigby has renounced all intentions of this, so it will be up to one of his and Snow’s cubs to take the mantle. The question is which one? The parents get to watch as their children are subjected to a series of trials and tests by the North Wind’s servants, while the East, West and South winds hungrily watch, looking to seize this power vacuum. Meanwhile, things continue along in the rest of the world, as Rose Red continues cleaning up and making sure everything is right on the Farm; the monkey Bufkin continues his attack against the new ruler of the Pan Ozian Empire; and deep in the shadows of Castle Dark, Nurse Spratt prepares herself for revenge, awaiting her first victim. 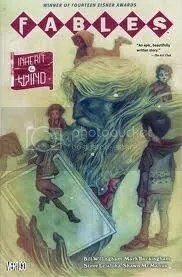 Inherit the Wind continues a number of Fables storylines, keeping readers riveted as to what is happening with some of their favorite characters. Along with some secondary storylines, it makes for another great collection of entertaining plot and beautiful artwork. Originally written on October 24, 2012 ©Alex C. Telander. 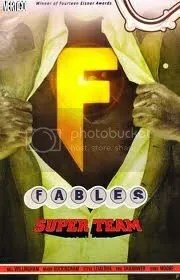 To purchase a copy of Fables: Inherit the Wind from Amazon, and help support BookBanter, click HERE. 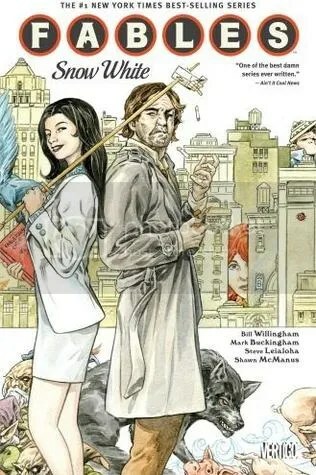 With the war done and over, the next chapter in the incredible saga of Fables kicks it into high gear under the skilled pen of Bill Willingham and artistic pencil and color of Mark Buckingham as Mr. Dark is finally confronted and a character that has been hiding from the world for some time returns. Rose Red has shut herself away from everything since Boy Blue died, unable to face her job and role as the one in charge of The Farm. But now things are going downhill fast, and dissension is growing and getting out control at The Farm, as the natives are getting restless and plots are being hatched and it seems like a coup may be in the works. With continued visits and visitations from the decapitated pig, Rose Red also receives a visit from her mother and is finally pulled out of whatever dark place that she’s been in, pulls herself together, cleans herself up and addresses everything that’s going on at the farm. At the same time, readers get to see the story of Rose Red’s and Snow White’s childhood, the good times and bad together, and of course those infamous seven dwarfs. Meanwhile back at Fabletown, Mr. Dark has his minions and is becoming scarily powerful. The Fables mount their first attack with magic and witchery from Totenkinder, destroying his zombie followers and finally stopping this creature of nightmare and fear. Celebrations over this defeat are short lived however, as Mr. Dark breaks free of his supposedly unbreakable bonds and seems little the worse for wear. We’re now well in to 2011 and as we begin passing through the days, weeks and months, we’re also counting down to Renovation in August with the 69th World Science Fiction Convention in Nevada. On August 20th, at the convention, the winners of the 2011 Hugo Awards will be announced. And the nominees are now out and listed below. A number of the books listed have been reviewed on BookBanter, as well as a number of the authors interviewed, and are linked below, simply click on the name of the book or author to read the review or read/listen to the interview. Award for the best new professional science fiction or fantasy writer of 2009 or 2010, sponsored by Dell Magazines (not a Hugo Award). 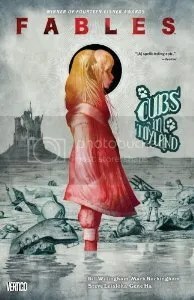 In the fourteenth volume of the award-winning Fables comic book series, writer Bill Willingham reveals his true intentions with the next important story arc after the great war between the good fables from our world and the evil ones of the Homelands. What’s left of Fabletown is a destroyed ruin, while its new king and owner, the mysterious and terrifying Mister Dark – the substance of all your nightmares and more – is building his own lair, plotting and planning. Meanwhile the disowned fables are hanging out at the Farm in Upstate New York, working out what they can possibly do against the powerful and seemingly unstoppable Mister Dark. The powerful witches of the former 13th Floor are plotting together to stop him, while Frau Totenkinder has an idea up her sleeve and disappears into an unknown place in the Homelands. And on another story, the now disconnected and lost business office, the giant home to all things fantastic and fable has managed to free the evil witch Baba Yaga, who employees the great genii to help her; it will be up to Bufkin, a flying monkey, to save the day. Witches pushes this growing story a little further along, adding some new characters and building on some familiar ones, as small, insignificant fables become mighty heroes, while others seem stumped in their current predicament. Willingham and Buckingham do what they do best, keeping this series fresh and addicting for readers who will be left impatiently awaiting the next collected volume. Originally written on December 22, 2010 ©Alex C. Telander.